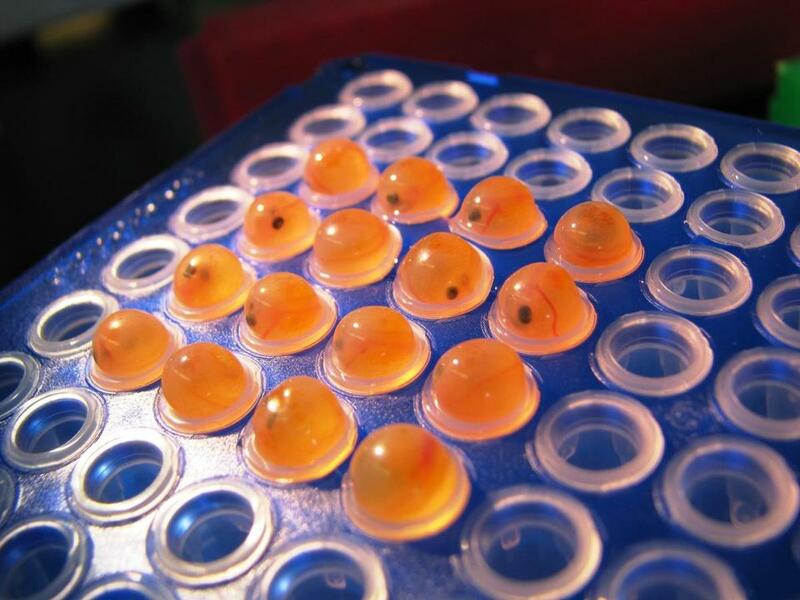 A 2010 photo shows salmon eggs at AquaBounty’s hatchery in Prince Edward Island, Canada. Sylvia Wulf sure was busy at the Seafood Expo North America last week, hustling to meet with various fish distributors and other business contacts. The AquaBounty Technologies CEO’s controversial product isn’t like the other fish in the sea. Her Maynard company produces a special kind of salmon, and she had a promising story to tell attendees at the Boston event. AquaBounty makes genetically modified fish, the first bioengineered animal approved for human consumption in the United States. The Food and Drug Administration gave the green light this month by lifting a ban that had blocked AquaBounty from bringing its genetically modified eggs into the country from Canada. Wulf expects to start moving eggs from AquaBounty’s Prince Edward Island hatchery to the company’s Indiana salmon farm within two weeks. She hopes to begin selling the fish in the United States by the end of next year, most likely through a food-service company to start. Eventually, she envisions a half-dozen fish farms across the country, and an ambitious overseas expansion. The FDA had approved the fish for consumer consumption in 2015. But US Senator Lisa Murkowski shepherded legislation that prevented AquaBounty’s fish from being sold until the Department of Agriculture crafted labeling guidelines. Those rules were completed in December, setting the stage for the lifting of the import ban. Wulf is new to this quest: She joined in January from US Foods, the giant food supplier, to help AquaBounty move into commercialization. But she’s already a big believer. The reason? She says the genetically engineered salmon can grow at nearly twice the pace of wild salmon and can get by with substantially less food. Those advantages, she says, could finally tip the scales to make the United States a major player in salmon farming, while curbing the environmental impacts of commercial fishing. It sounds great, but not everyone is buying it. AquaBounty’s list of foes goes beyond an Alaskan senator and her state’s salmon fishing industry. A coalition of nonprofits generally opposed to genetically modified foods continues to press on. To them, this remains a giant unresolved experiment. Their best hope now may lie with a pending lawsuit they filed in federal court in California in 2016 to overturn that initial FDA approval. One of their chief concerns: The FDA used a review process reserved for veterinary drugs, an approach critics said was simply inadequate. Patty Lovera of Food & Water Watch says she’s not confident the feds have a reliable system in place to assess the consumer risks of bioengineered animals, while Megan Westgate of the Non-GMO Project points out the labeling rules won’t be mandatory until 2022. The critics also worry that these modified salmon, derided as “Frankenfish,” could escape and breed with wild fish; AquaBounty says it takes several steps to prevent that from happening. Meanwhile, AquaBounty has been trolling the waters, looking for more shareholders. The company sold stock last week, with the goal of raising $7.5 million to help pay the expenses at its Indiana and Prince Edward Island farms. AquaBounty had previously received a lifeline from Intrexon, a Maryland biotech that owns a controlling stake in the firm. To Wulf and her team, the AquaBounty salmon represents a new source of sustainable protein, a safe and tasty alternative to conventional farm fish or to seafood caught in the wild. They now need to convince investors and the public that they have a winning catch on the line.